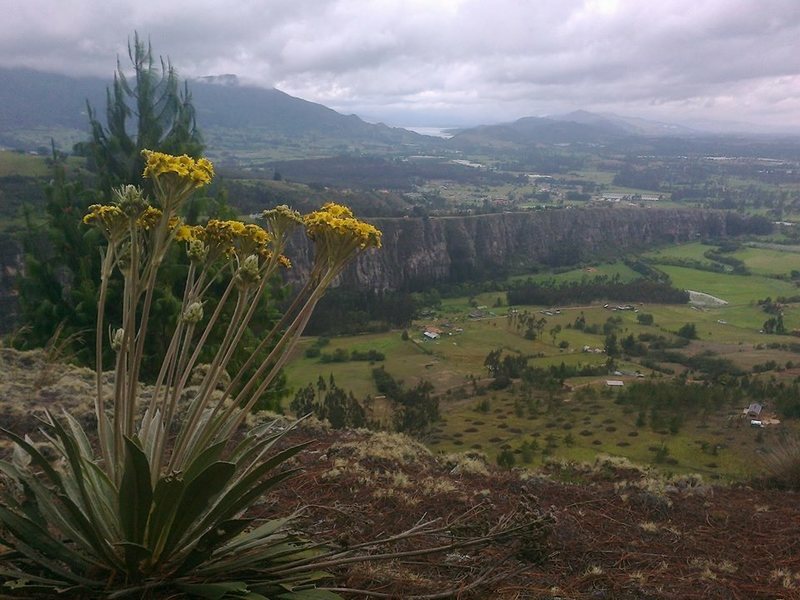 An hour north of Bogotá is located Suesca, the sandstone cliff where colombia´s rock climbing began in the country approximately 80 years ago. Today the area boasts more than 500 routes, with difficulties ranging from 5.6 to 5.13c And routes up to 5 pitches long(approximately 150 meters high). 1 hour by car from Bogota, take the north highway and head to Tunja, you have to pay 2 tolls, then you look for the bridge and the singal for Suesca on the right side, take this exit, roundabout on the bridge and in 15 minutes you are in the area, you will find a place called "ricapizza", and then the train tracks that lead to the cliff. You can also catch a bus from the "Portal del Norte" station on Calle 180. The bus is red and the company is called Alianza, it costs 7,000 pesos ($2.5 USD), and can drop you off at the exact entrance to the crag or at "ricapizza". Busses run from Bogota every 15 minutes. Biz card front for Hostal el Descanso. The rocas de Suesca cliff. Back of Hostal el Descanso biz card. If anyone has any questions about Suesca feel free to message me. I've spent about two months here climbing. Here is a full information post about the logistics of Suesca. Even a photo of a local rock guide! Fun place - we stayed several nights at Nomada Hostel (~$10 US/night) and it's a 5 min walk from there. The town is dead during the week. Guides are about $30 US each for a half day if you want to get a feel for the area. The local climbers are also pretty friendly and open to climbing, making it fairly easy to find a climbing partner if you hang around the hostels. Great climbing in Suesca. Easy access from Bogota via the bus and the climbing is easy to access thanks to the train tracks. Plenty of options for lodging, tent, hostel, or you can even splurge to live like a king if you look on airbnb. TR listed on our blog. Just those sections (and there are lots of others between La Virgen and Zona Alcatraz) are not currently in the correct geographical order here on MP. Suesca is a fantastic place filled with lots of great traditional (and historic) lines. The Black Book (Libre Negra) was apparently the first rock climb in Colombia, put up by a Swiss guide named Kraus in 1938. LP, at the far end of the cliff, is a Gunks-like line that wanders through intimidating terrain at a moderate grade. Many of the bolted routes were put up early in the sport climbing game and hence, are at times seemed to us to have been stupidly bolted. It appeared to us that some of the developers were looking for difficulty and decided to ignore big holds and obvious lines, making some of the bolts purposely hard to clip. As of 12-2016, there were several discussions on MP about Suesca (use the search function to find them). There are several places to stay right in the heart of things (that is near the climbing shop and Rica Pizza). The climbing shop has a hostal and there's another a bit further down the railroad tracks, roughly across from the Suesca train station (a two-story green structure with "Suesca" on the side; it's only visible while walking the train tracks). If you're a couple, looking for something other than camping or a dorm room, consider Hostal el Descanso. It's run by a charming older lady and is about 150 feet to the right of the climbing shop. We got a large room with cooking facility and great hot water for less than 50,000COP/night. I'm confident those staying longer than a week could negotiate a cheaper per night price. I've posted the business card for the hostal in the general photos section for Suesca so you can make contact ahead of time if you wish (the owner doesn't speak English). If you look on Airbnb, Booking.com and other internet sites, you'll find lots of other places to stay. Be aware that some, despite what their pictures may appear to show, are on the opposite side of the river from the cliff (this is a problem). At least one place (where we stayed the first night we arrived in town) is shown on the mapping features of these websites to be in the heart of things (right by the climbing shop), when in fact it was a 20 minute walk away (a bit of bait and switch). Groceries may be purchased in the little enclave about 300 yards down the road/tracks heading away from the actual town of Suesca. There are three bakeries, a grocery store and a couple small, basic eateries (empanadas, eggs, etc.). The eateries were open until at least 9pm; the grocery store seemed to close at 8pm. If you need an ATM, you'll have to go into downtown Suesca (about a 20 minute walk from the climbing shop). There are two restaurants right in the heart of things (by the climbing shop) - Rica Pizza and Restaurant Dona Maria. Both serve large portions and compared to the rest of rural Colombia, are overpriced for what you get (20,000+COP/person plus drinks). Weirdly, only one was open on any given night during our visit to Suesca in 12-2016. The local guides were very friendly and glad to help orientate us to the area. Getting to Suesca can easily be done by bus. From downtown Bogota, get to Portal Norte (a bus terminal on the north side of the city). Try to avoid Portal Norte during rush hour (the crowding makes the NYC subway seem tame). Grab a bus labeled "Suesca" and in about 1.5 hours, you can be dropped off right in front of the climbing shop (note that several minutes before the climbing shop, you'll see a large Madonna in a cage on the right side of the road - this is your cue that it's about time to get off the bus). On the return to Bogota, stand in front of the climbing shop and take a red bus back to Portal Norte. From Portal Norte, you can catch a series of buses and end up right at El Dorado Airport. New to the area need a guide! Here ya go! Do you need a partner to climb in Suesca? maybe a guide to show you around? perhaps an instructor to help learn how to lead multipitch trad climbs like a boss?? or do you just need to get some beta (tricks, weather, food, gear, planning, etc)? Then please don´t hesitate to call or write, i will be happy to help. i am a guide and instructor with 17+ years climbing and living here. this is an article in Climbing magazine about Suesca. SUESCA - In a nutshell, I came because of a great trip report I found by happenstance. I messaged the author to ask more questions as the write up painted Suesca as a must visit place for my climbing fix. Coincidentally, he said he actually was thinking of visiting there again during the time I would be able to check it out. Went intended to stay for 5-7 days to get a few days of climbing in, and i ended up extending for another few days... and another week.. and another two weeks. I could not leave. The environment is amazingly beautiful, think Smith Rocks, in Portland, OR. It was the following Blog post that got me there. But the people, the amazing landscape, and the nurturing vibe that got me extending every few days, until I spent all of one of my 3 months I afforded to travel in South America this trip. I loved it that much. Scenery: 9/10, it is like Smithrock for majestic landscapes. Rock quality: Very solid/bomber sandstone. I've sport climbed for 5 years on sandstone, limestone and granite around the world. The rock here is super hard sandstone, it almost feels like you're climbing on limestone. Can be slick in spots on the very popular beginner routes. Routes: Variety of routes. Over 400, that line a 2km cliffside. From extremely balancy, slab.. to overhanging roofs, and lots of trad lines.The routes I've tried were really good, between 5.9-5.11b. This is origin of Colombian rock climbing so the ratings are relatively stiff, and first bolts are pretty high (average about 15 feet off the deck). Routefinding is also hard so would recommend asking locals or hiring a guide for some orientation. I only tried sport routes, but from what my trad friends were saying, it has stellar classic trad lines as well. Only has a few multipitches which top out at 4 pitches. Can keep someone busy or coming back for months. Ease of finding a partner: It is not particularly easy to randomly walk into the crag and rope up with someone, as during the week, there are few visiting climbers there and on the weekends, it is local colombians coming from Bogota to climb with their partners just for a day or so. However, there are half a dozen affordable guiding operations that line the road right next to the entrance to the rocks. Some friends that I met in Suesca were happy with the guides from Green Languages Colombia, which also runs a Spanish language school. Luckily, I had befriended two volunteers that helped out at the hostel I was staying, and they took me out with them, and we because really good friends. Though they left around the same time I did. Spanish level: There are English speaking guides, but the local shop owners don't speak English, but are super friendly. I got by on my very basic spanish (one week of lessons!) If you are looking to learn Spanish, I would highly recommend taking lessons from Green Languages Colombia. Nino the owner is also one of the teachers and is a climber, too. She is super connected to the community and can set you up with one of the guides that partner with the school. The classes are very small, either 1-2 other students, and sometimes you may luck out and get 1:1 classes. The rate is very very affordable, and great because you can learn Spanish during the morning, and then go climb in the afternoon! Accomodations: I stayed at El Nomada Hostel and would recommend it. They were building a bouldering wall of decent size when I was there, and were halfway finished with it. It also has a great space, vibe, and super friendly staff and adopted dog named Elvis, haha. He's so sweet and will follow you around down the street, and even to the crag sometimes. Off days: There are great hillside hikes you can go on for 1-3 hours, that overlook the cliffsides, and look down on the river and train tracks that skirt the crag. You can also rent bicycles at the hostels or bike rental shops and ride to the next down, called Santa Rosita, which is a beautiful little puebla with like a thousand residents and hundreds of cows, a few dozen sheep and horses, roaming around the dairy farm areas. There are also guided tours around different areas for activities like paragliding, paintball, rafting, and hot springs. For parking: Turn at the climbing shop and follow the dirt road over the tracks to a parking area on the left. It cost about $3.00 US, payable when you leave. A warning: There is some confusion about land ownership and climbing fees. If you climb on the left end of the cliff (past the kiosk), the property owner requires that you to pay a climbing fee, which is supposed to go to trail maintenance, etc. Fair enough. During my visit, however, it was unclear where to pay the climbing fee. The owner lives directly in front of El Gran Diedro and can see you climbing, and may call over to you. During my visit (Nov 2018), there was no fee to climb on the right side of the cliff, but there was a fee in the past. In my opinion, the various owners of the cliff and parking should coordinate so it's clear where (and who) to pay, and hopefully only have to pay a single fee. One more thing: We were told by locals not to leave a pack at the base of the cliff on multi-pitch outings. It seems standard practice to haul your stuff up the cliff and hang it on high bolt. Suesca it’s an amazing place for rock climbing. It has a lot of sport, trad and even multi pitches routes. Probably one of the best place for trad climbing in whole South America. Directions above are awesome thank you all for sharing. But, my wife and I stayed at Hostel Camino de Suesca. Felipe was guiding us all over the crag, fulfilling our requests of multi pitch trad routes and special attention to repelling; we also touched a bit of sport climbing. We stayed for 4 days and 3 nights. Cozy little pad, and everyone there is so cool and helpful. We were lucky enough to have Felipe as our guide; he is a seasoned veteran of Suesca and a first responder for emergencies. I actually had no idea that there was climbing in Colombia, but was fortunate enough to come across Suesca while I was researching where to go next from Bogota. It’s been a couple years since I’ve really been outdoors, but Martica at Rock Climbing Suesca is amazing and will orient you, take care of you (if you book a tour with her, she’ll bring you a yummy lunch so you don’t lose any time! ), and make you feel like you’ve found a new best friend. I spent the day with Juan, who is an incredible guide, climber, and human being. We did nine routes that day, including a multi-pitch—he was awesome at listening, pushing, challenging. And added a ton about history and context of the rock, town, and Colombia. So highly recommended—the only regret I have is that I didn’t allow for more time—climbing, of course—but also to connect with the dope people that make up the climbing community here. Suesca was an amazing place to experience and climb in. You can see the train passing by, the locals going for a walk, and the cows across from you as you climb.